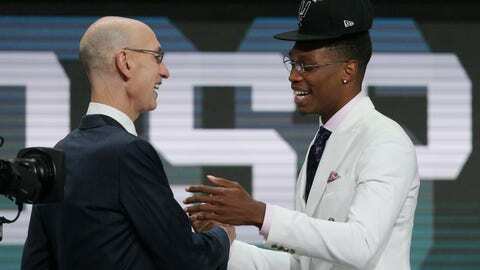 SAN ANTONIO (AP) — The San Antonio Spurs have taken shooting guard Lonnie Walker IV out of Miami with the 18th overall selection in the NBA Draft. With uncertainty surrounding the future of Kawhi Leonard, who reportedly requested a trade, the Spurs opted to draft the athletic Walker, who averaged 11.5 points in his lone season with the Hurricanes. The Spurs remain optimistic they can persuade Leonard to remain, but the superstar forward reportedly wants to leave the only franchise he has played for. Leonard played in only nine games last season while battling a right leg injury. His absence along with injuries to Tony Parker, Rudy Gay, Pau Gasol, Kyle Anderson led to San Antonio’s worst season in two decades. The Spurs finished seventh in the Western Conference at 47-35, snapping a streak of 18 consecutive seasons with 50 victories. San Antonio battled until the season’s final week to extend its streak of consecutive playoff appearances to 21 straight. San Antonio also had the 49th selection in the second round Thursday night.